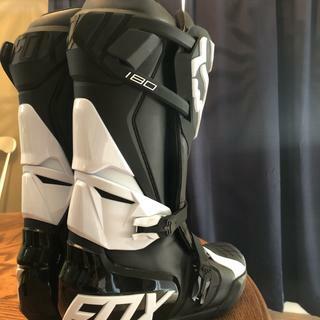 Completely new in Fox’s boot lineup and significantly different from any other boot out there, the Fox Racing 180 Boots deliver race-proven features inside a unique, new design. Built off the success of Fox’s premium Instinct boot, the 180 borrows several premium features and works them into a more affordably priced boot. Features taken from the Instinct include two ball-and-socket buckles that pull the ankle down into the heel of the boot, a very large, very flat medial side of the boot that greatly increases grip against the bike, and step-in comfort that Fox puts into their boots to make them some of the most comfortable on the market. The 180’s similarities end there as the rest of boot is so unique. 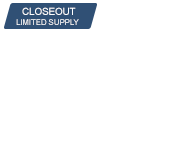 The upper closure steers away from the typical velcro/buckle closure and uses an adjustable silicone strap instead. 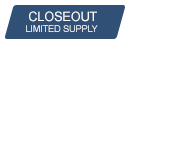 This allows the upper to have a secure closure that fits nearly any calf size or knee brace and an engineered amount of slip so the closure can move with you as your leg and ankle flex. The 180 also features a floating cuff system at the ankle right behind the top buckle. This system gives the top buckle the perfect placement for a secure fit, but it also works with molded TPU pieces on the rear of the boot to act as a lockout that prevents over-extension and potential ankle injury. The result of these innovations is a mid-tier boot with great protection, excellent comfort, and next-gen features that many premium boots don’t even offer. Very happy with these boots. I read other inputs on them I got one size bigger and they fit perfect and I can move around well in them. Really like these boots for the money. I wear 10.5 with every shoe type and a size 11 fits absolutely perfect. I am an avid weight lifter and the calves are snug with riding socks and pants tucked in, but not uncomfortable. Perfect! great boots so far. I wear a size 10 work boot and bought a size 11 in these, they fit perfect. little to no break in needed. comfortable, easy to step into and out of. very happy with these. A great entry to mid level boot. Very little break in. Good, positive feel on the pegs and frame. The buckles hold firmly and I havent had one pop loose in the last 10 hours on the bike. I recommend going a size or two larger than what you normally wear in a sneaker. For the price I dont think you can go wrong. Haven't gotten a chance to ride due to weather but I love the look and feel of these boots. I chose these because I wanted a boot with an extension lock-out that was under $300. 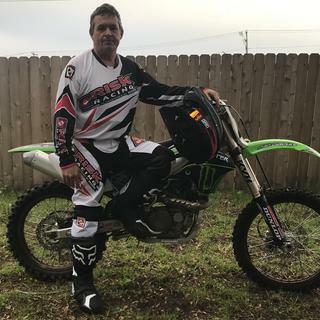 Overall, they are great boots, they look great, and are very comfortable to both ride and walk in. The sole/inside of the right boot has gotten tore up a bit from kicking my bike and hitting the footpeg on the way down but other than that they are holding up wellt. Also the strap system can be kind of difficult to get locked in, it takes some practice to get it right. I was nervous to order boots online because of the fit. I was pleasantly surprised with both the quality as well as the fit of these boots. I ordered them in size 12 because I fluctuate between 11.5 and 12 . They fit fine, but I thought they would be bigger than they are. I emphasize though they fit fine. I'm still breaking them in and I'm anxious to see the fit after 6 or so rides. My Daughter Loves them. Great purchase, great product. Awesome boots! They look great and are very comfortable! Good boots at a good price. Make sure to order at least 1 size bigger. Good boots for the price. A little narrow for guys like me that have EE wide feet, and you’ll want to get a size bigger than normal, but still very comfortable. Could have better ventilation, I haven’t had a chance to go for a ride with them yet, but they are quite warm just walking around. Good flexibility and protection. I would recommend to anyone not wanting to spend a small fortune on boots. Haven’t had a chance to ride with them on yet but the fit and finish is beautiful! There is not going to be a break in on these but they do run a little small. 4 stars because haven’t rode with them yet. Good value especially on sale. Comfortable. A little tight on my big calves. I’d love to be able to use knee braces with them but I’m not sure I’d be able to with any brand boots. Run small. I wear a 10.5 shoe, need an 11 in these boots. For the money I can't say enough! Boots fit great. Very comfortable and lighter than my other boots. Great boot for the money, ordered a pair bc I saw they were on closeout and I was due for a new set. I purchased the black set and man due they look awesome, I’ve tried on the instincts and tech 10’s and these fit better and I feel like I walk better in these as well. Pulled them out of the box and they still had $250 price tags hanging on them, ended up paying under $200 for these.. ORDER A SIZE UP! 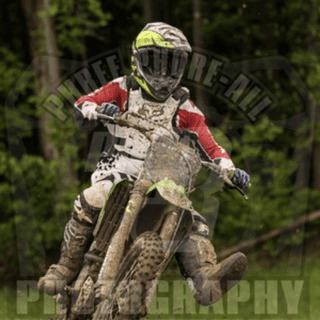 I am new to motocross. Was not sure what to expect from the boots, especially ordering online. Listened to suggestions and ordered one size up and the fit is good and comfortable. Boots are easy to put on and fasten and provide a real safe feeling while riding. Bought these boots for my daughter, and with her knee guards the boots barely buckle. The strap is loosened all the way, and it is still a struggle. There is a big gap in the boots where it straps, when she wears it. She wears a womens 9, and the mens 8 is too small. These boots broke-in after 1 ride! Super comfortable and the buckles are very simple. Order a size up! Did not fit right the boots would not close all the way at the calf. Weird top strap. Impressed with the quality and comfort of these boots. Good boots, good feel, the calf is a little small to get knee and shin guards under. I went back and forth on what boots to get and finally decided to go with these. I couldn't be happier. Super comfortable on and off the bike. I really like the latch designs as well. Quick to put on and take off. I would definitely recommend these boots. Better than Alpinestars tech 10, better than fox instincts. Costs half the price. These are great for athletic people with average calfs. If you have thicker legs stay with tech 10s. These look better though and feel so much better. Premium quality boot with entry level price. Boots are great quality at a great price. They are extremely comfortable and have the premium boot feel at an entry level price. I love how great they grip the bike and also the foot pegs. Boots gripped the bike well even in the mud. 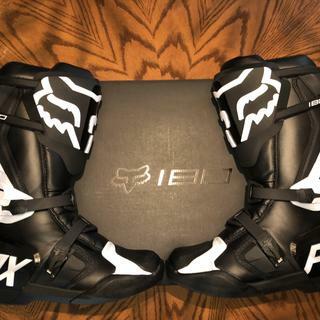 I bought the Fox instinct last year and just recently purchased these. The instincts are still holding up and have been a great boot, I just wanted a backup. These feel very similar and for the price I would say are a better value. Very good boots for the price! Love the boots! They are very comfortable and take no time to break in. They are on the smaller side so make sure you go one size up. Easy on and off and very comfortable after a couple hours. Just a tad stiff on the first time out. But after a quick break and back on the trail I couldn't even tell they were new boots. Very comfortable and very easy on and off. I wear an eleven in my cowboy and work boots and with my mx socks on the 12 fits perfectly. 1 race in wearing these boots. Replaced Tech 8's. These boots feel much lighter. Very comfortable and easy to put on/take off. I noticed my feet flying off the pegs more than they ever had but that may be just trying to go fast after 6mo. of not racing. Really happy with these boots and the fact that they cost about half of the premium boots. Had to get 1 size up from normal for a good fit. If they hold up I think these will be my favorite racing boots. These boots are very comfortable and wont break the bank. 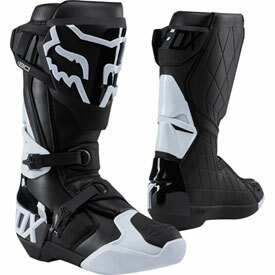 Fox has made an extremely easy boot to take on and off and offers good protection. Didnt take long to break them in either. I highly recommend. No break in. Extremely comfy. feels great. Good protection. Great price for what you get. 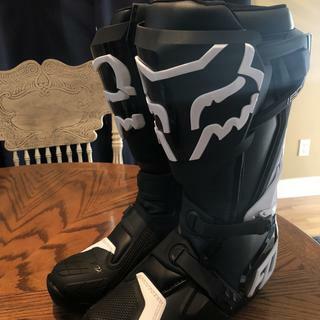 like all fox boot you need to get a size larger then you normally wear. Awesome boots, super comfortable to wear and almost zero break in. The top latch is convenient and quick to throw on. I’m a 10.5 and bought an 11, the fit is perfect. Good quality boot. They are upgrade to my comp 5's. Not much more than the comp 5's with a lot of the features of much pricy boots. Do these boots fit on the large or small side? I’m in between sizes. They fit a little on the small side. Be sure to use the fitment guide before ordering. I typically wear a 10.5 shoe and I ordered a size 11. They fit perfectly for me. Definitely go up a size. I wear size 9, ordered 10 and the fit feels just right. Id say larger. I usually wear a 9.5 maybe 10.5 max and i ride in a 11. I normally wear an 8 shoe. I purchased the size 9 and they fit well. If you are in between sizes go up and you'll be fine. Will a size 8 boot fit a 18 inch calf? What’s the difference between this boot and the Comp R? Will it ship before Christmas? BEST ANSWER: Yes, if you order today before 5 pm MST it will ship out today and arrive by Thursday/Friday.